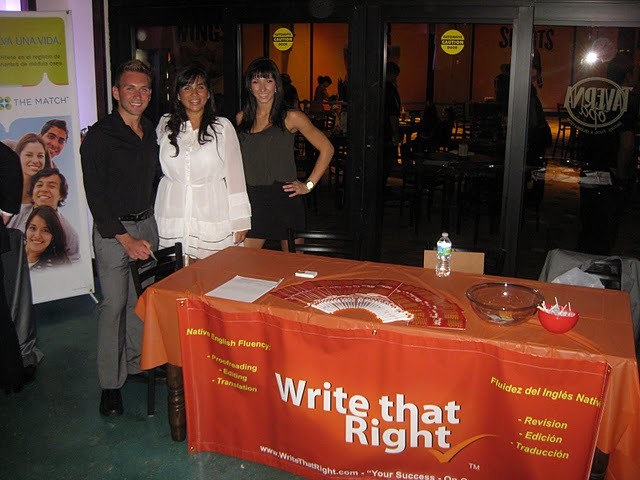 at a networking event promoting my company, Write that Right. I’d first like to start out by saying that I have no background in business, marketing, econ, advertising, or anything remotely useful when you think of shaking hands and smiling after a successful deal. In fact, I don’t come from a family of business savvy 1 percenters either. While my parents did well for themselves, it’s because they are pretty smart and were able to leverage that into succesfull careers in both law and medicine. At the ripe old age of 25, I have managed to become a decently successful entrepreneur. I now own a web development/internet marketing company and work as a consultant for experiential marketing campaigns and events. I’d love to say the reason for doing pretty well is because I went to an Ivy League business school and now have a deep network of old money big wigs, but, I didn’t. I think the main reason I can attribute my success up to this point is because of my love of travel, that and graduating in 2010 and forced into the working world when the job market sucked more than Monica Lewinsky on two shots of oval office cognac. Here’s my thought process. In the US, there is no such thing as “gap year”. If you are lucky enough to have your parents pay for your college education like I was, then you finish high school at 18 and ship right off for university with your head still spinning. I’m pretty sure if you ask anybody about their first year experience in college, you will find a high percentage of people say that it invariably, sucked. Many kids would say they weren’t ready, the complete freedom was too much to handle, or like me, you get arrested for a fake I.D. and smoking pot on the roof of your dormitory. It was after my 15 hour stint in Miami-Dade County Prison that I realized that, maybe, it would be best for me study abroad and get my head on straight before coming back to Miami and making the most of my time there. So, after my first semester sophomore year, I shipped off to Barcelona to focus on learning a new language, culture, and above all else, drink beer legally. Obviously at first I partied and drank more than a fish, but after a while, I started to realize that I was wasting my time. I began letting myself step out of my own shell and exploring things that truly interested me personally, and not letting the college “bubble” influence my decisions. I became enthralled with the arts and the Spanish language and spent the rest of my time immersing myself in them. I really felt a lot of personal growth at that time, and when I returned to college in Miami, I felt years older than my keg-pounding peers. I had previously been in a fraternity before leaving that I immediately dropped, I became much more focused on school (I was studying exercise physiology), I began working as a personal trainer at the gym which I took pretty seriously and I began to feel like an adult rather than an overgrown kid. I completely attribute this to my time in Spain, because who knows what I would have turned out like if I didn’t. I like to think that I’ve always been pretty open to other types of people, cultures, etc, mostly because my family raised me that way, but when it comes to really communicating with people from other cultures, it took a lot of traveling and immersion to understand how and why people think and act the way they do. After living in Spain, I decided my life abroad was cut short and I immediately booked a trip to Buenos Aires, Argentina for the summer to try and solidify my Spanish a bit more. I liked to think that after Spain I spoke Spanish pretty decently, but when I got to Argentina, I didn’t understand a damn word for my first two weeks. Why? Because the Argentinian accent sounds like an Italian person singing. But, the main reason I didn’t understand anything were the mannerisms. Argentinians flail their arms while they talk, kiss anyone on the cheek they meet (boys and girls) and will put their arm around you and belt out a “che boludoooo” any chance they get. For me, this was a whole new way of communicating. I was so used to shaking hands, standing 2 feet away while speaking in a monotone and keeping my arms at my sides tighter than a new recruit at boot camp. But, after a few weeks, I became one of them. I was speaking in sing-song tone, throwing my arms around like a drunk person trying to catch a football and kissing anybody’s face that came within arms length. After I got back to Miami, and after spending another extended period of time in Mexico learning a whole other way of “speaking Spanish”, I felt comfortable talking to people from all over the Spanish speaking world.This has helped me exponentially in business as 1. people are pretty shocked to hear a gringo speak Spanish and 2. I purposefully change the way I speak and what I speak about to people depending on where they are from. This breaks the ice and makes people much more receptive and interested in what I have to say. I’d say the most valuable skill I learned in college was learning another language, and it wasn’t even my major. Living in Miami, speaking Spanish is crucial and I’d say at least half of my clients don’t even speak a word of English! When I travel, I’m not staying in nice hotels, traveling with my friends, girlfriends or family, and most of the time not directly for business either. This means I’m solo dolo, i.e. if I want to talk with anyone I have to go out of my way to be friendly and make the effort. Staying at hostels helps make this truth easier as many of the people staying there are in the same boat and pretty like minded. This being the case, it pretty easy to find someone to go eat with, grab a beer or split the cost of a cab to the airport. After traveling pretty heavily the past few years, I now feel completely comfortable walking up to anyone and striking up a conversation. This confidence has helped me greatly in the business world as I have no problem calling up a stranger and asking to do lunch, going to a networking event by myself or just working on projects alone as I’m used to doing things myself now and I feel perfectly comfortable doing so. If you talk to any entrepreneur, I’m pretty sure they’ll tell you that they didn’t get to where they are by following conventional practices. Of course you can follow the “model” and find success by working hard for your whole life, but I think in today’s rapidly evolving and digitizing and volatile world,it takes thinking outside the box to make things happen and on your own terms. Traveling is just one of those parts of my life that keeps me on my toes and staying on top of things. It always stimulates me in new ways, throws something new into the mix, and keeps me growing, so while I’m sure an MBA would be worthwhile, I’m taking a chapter out of the book of life, and thus far, it’s been the best education I’ve received yet. Has traveling helped you professionally in some way? Posted in Inspiration and tagged with Entrepreneurship, Personal Reflections, Traveling, Traveling Tips. RSS 2.0 feed. Amen! I couldn’t agree more, and well written Beldar! My travels were twice to Central America, both with friends and the intent was surfing. What I learned was how little we Americans and other people of highly developed countries get in touch with our animal sides, meaning our basic instincts. Something as simple as a one- or two lane highway can mean all the world to those in countries such as Costa Rica, but here we see it as another traffic jam. Speaking Spanish also helped in countless daily occasions, as I found that by the end of our trip I was doing much of the talking on my group’s behalf. Speaking with the locals on their level even ended up saving us from a dicey situation at one point! Staying at a hostel is a good experience as well, like you said. Haha agreed Sir Tim! I think cultural sensitivity like you mentioned is extremely important as well. When you just make that effort to speak to someone in their own language, even if you and they know your not fluent, goes a long way! What I like about travelling is that it justifies the saying ‘mixing business with pleasure.’ even if we go on a Holiday, opportunity always presents itself whether by form of new network, ideas or inspiration. For me, it’s really fresh ideas, innovation and valuable insights from the people i meet or the culture I experience that helps me grow not just professionally, but personally as well. Thanks for sharing this, Jeremy! Thanks for the great comment Cacho, I totally agree, the people make the trip! Just starting our travels in Japan in a little under a month so will be interesting to see what we learn from our trips and how it helps us in the long run and out future endeavors! I’m sure we will have similar takeaways to yours! Hey Vicky, awesome, Japan is definitely on my bucket list! I hope you have a rewarding/awesome experience!